My graphic tablet works properly with Inkscape 0.46, but it does not with 'Inkscape 0.46+devel r20711, built Feb 17 2009' I downloaded from 'http://inkscape.modevia.com/win32/'. In the 'Input Devices' dialogue it appears like a long line of kanjis and cirillic symbols instead of the tablet name (Aiptek SlimTablet 6000U) and nothing can be configured. I have a Wacom Intuous 3 and found late last year that it wasn't working with the development builds. The device is listed in 0.46+devel just like it is in 0.46. I can use the table to select tools, menus, manipulate controls, but it does not work on the canvas. My OS is Vista 64bit. I can confirm the issue with my Wacom Intuous 3 on both Vista 64bit and XP 32 bit. I can confirm that the tablet works in 0.46 for both Vista and XP. I can confirm that on Vista the tablet also works on GIMP 2.6.4. I can confirm that tablets did work in builds dated around September 2008. I can also confirm that the Windows XP default drivers for tablets work with 0.46+devel (but I didn't test that pressure worked). It's only after installing the Wacom drivers did interaction with the canvas stop completely. The tablet works to interact with any of the controls, it just doesn't work to draw on the canvas. I also know that one of the RC drivers Wacom released killed support in all GTK applications. I'm happy to help test however I can. I'm running XP in a virtual PC so can get quite destructive. sorry that I don't recall the name of the shortcut in the CP). work to draw on the canvas. need to make sure this is solved soon. Rise importance. Adib. I've actually uninstalled all Vista tablet sevices so the none of Vista tablet features function. The features offered only applied to tablet PC's and were annoying with desktop PC with a graphics tablet. My issue also applies to XP--although I'm running it in a VM Guest on a Vista Host, but I don't think that should matter. If I launch XP then open Inkscape and then only connect my Graphire3 it works. But then if I close and re-open Inkscape it fails to work again. Your build don't work with my graphic tablet. I have a Bamboo Fun (CTE-650/K) graphic tablet and Windows XP SP3. Can you please be more specific? Does it not work at all? Does it only work on menus and toolbars? Does it work on-canvas, but not provide pressure support? Also, can you please try to launch inkscape with the tablet pen? I have seen some comments in various reports that doing that will get their tablet working for that session. Thanks. Excuse me. I did more tests. At the first startup of Inkscape, my graphic tablet works on menus and toolbars but not on the canvas. But after changing configuration in Input Devices dialog box, my graphic tablet works and pressure also. Finally it works after configuration. Thank you so much for testing this further! This is the result we were hoping to see. perfectly--I didn't need to configure anything. > nothing can be configured. You are correct that the one on SF does not contain the newer libraries. Have you tried to download the file using a download manager or a decent FTP client (most can download things fine via an http mode)? As for the sensible defaults, I do not think that it is possible as different operating systems and different models of tablets report the devices with different names. Will you please try with the final 0.47 which is up on SF.net? I can confirm the issue with my Wacom Intuous3 on XP, using version 0.47 stable release. Using Wacom I cannot draw in document, but can use menus, etc. Normal mouse has no probems. And Wacom works fine on 0.46. A number of the people above had their issue resolved by configuring the tablet via the input devices dialog again, have you done this? I believe some things have changed which would not allow it to work with the previous configuration from 0.46. At first the "Input Devices ..." dialog did not seem to help. But after playing with various setting it suddenly works for me. This issue did not affect me in v0.46. When Inkscape starts, I cannot draw on the canvas, but I can click menus and toolbars with the pen. The fix mentioned above works but only until Inkscape is closed. On restart the tablet must be configured again. The devices menu has the same issue as https://bugs.launchpad.net/inkscape/+bug/306322 but still configures the device ok. I also have a similar error (to bug 306322) on startup: "The preferences file C:\Documents and Settings\[user]\Application Data\inkscape\preferences.xml is not a valid XML document. Inkscape will run with default settings, and new settings will not be saved." I have tried renaming and also deleting this file but the error still appears. This error was not present on the fresh install, but only appeared after I configured the tablet and saved the configuration. This particular aspect of this bug is particularly annoying since it makes autosave useless. And the rest, including Pressure, is not configured (set to empty/nothing). When I select the device again in the Device dropdown, Pressure is set to 3. I press Save and it works. Unfortunately settings revert to defaults (Pressure not set) after closing and launching Inkscape again. It may be as was mention in the thread, that there is some kind of error while saving/loading preferences.xml, that forces the program to use default values. Maybe this will help in some way. Thank you Michal. This seems to be a case that would be simple to address. Others might be seeing problems from other causes, but at least the one you describe should be simpler to address. I have a wacom intous 3. No problems with version 4.6 but now above problems with 4.7. Have tried above options with no result. Can you help? It appears that this bug happens because the device name is reported in UTF-16, and the preferences try to store it as UTF-8 (and fail). No, that's not it. GDK explicitly converts from UTF-16 at gdk/win32/gdkinput-win32.c:410. There is very useful information in bug 306322 (I'm not 100%it's a duplicate but it looks that way). I think this is caused by some device drivers reporting garbled names that contain things like \x03, \xf3 and the like. We need to escape the device name before storing it in prefs to fix this. Something very simple like g_strcanon() might work, since the conversion only has to work one way. Attempt at fix is in revision 9177. Please test. Please try this nightly build to see if the problem is fixed. It works fine now on my XP SP3 ! After selecting the (corrupted) device name, it assigns "3" to Pressure. down on them, but painting tools like "Calligraphy" do not paint. I deleted the old AppData settings, but this did not solve it. > It works fine now on my XP SP3 ! > Please try this nightly build to see if the problem is fixed. > of a duplicate bug. > 6000U) and nothing can be configured. preferences.xml is attached - See lines 966 to 976. 1. What happens when you change the Mode (in the upper right corner of the Input Devices dialog) from Disabled to Screen and save the settings? Can you use the tablet? the same, but some do appear to be random or different. 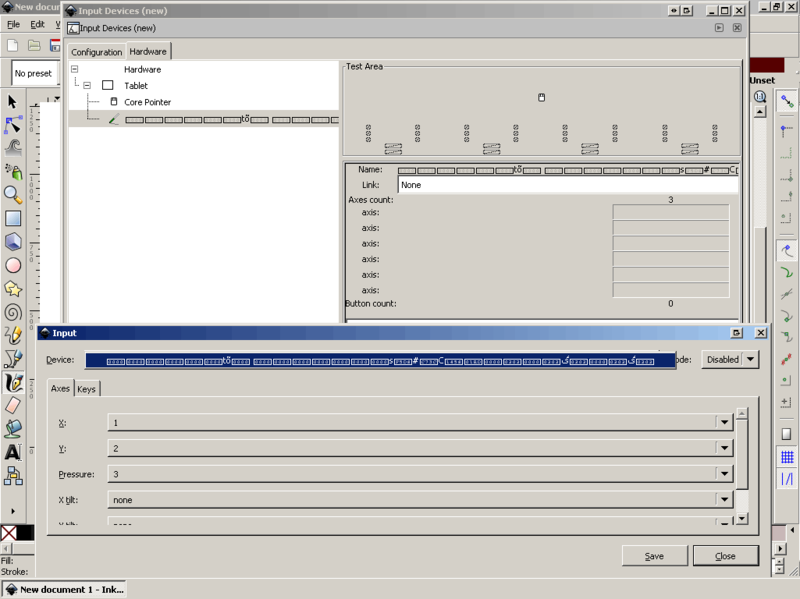 After rebooting, changing the Input mode to Screen, saving, and quitting, this is the resulting preferences.xml file (see attached, and compare lines 967, 975, and 977). OK, this information was very helpful. Was the tablet usable for drawing in step 2 after you changed Disabled to Screen? If the device name appears to be changing between runs, this looks like a bug in the drivers or GTK where random data is coming in. The current fixes should help with a work-around, but a little more is needed. There is some additional data that can be used to identify different parts of a compound device (e.g. one with an eraser and/or puck). We should also look into splitting up these different "fails on Windows" tablet bugs, as they do now seem to be different issues. This "mangled name" issue is different than some others. It would probably be good to use g_utf8_validate() to test the reported name instead of the current hard-coded check. The GdkDevice's "source" member can be checked for the GdkInputSource values. When "broken", constructing a name that includes the source, has_cursor, and num_axes combined will be quite useful. Constructing a name in this manner will allow for identifying the parts of a stylus, etc. (where cursor is the puck, or mouse-like accessory for a tablet). "Core pointer" is the default mouse, and "pointer" often shows up for a trackpad (these might operate as one). Mouse devices should usually be working. Those other names could be used for the first instance of each type that is reported, with additional devices of the same type having the additions appended. Base improvements for generated names are now in. Things should now function well for tablets with more than a single input.